October 31, 2008- Halloween Starts off with a Bang for SHFD!!! 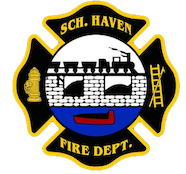 Just after 12:20 the beeps were hit for 135 Haven Street, Schuylkill Haven Boro, for a reported kitchen fire. As most people were responding to their respective stations, the SHPD were going to the scene to evaluate the situation. As the Schuylkill Haven Police arrived on scene, they reported to county of a Working Structure Fire to the rear of the residence. On Duty Chief 720 (Peel) also arrived and confirmed a working fire, and only after a few minutes upgraded to a 2nd Alarm. The second alarm brought in: Ladder 51 (Pottsville City), Engine 56-10 (Orwigsburg), and Pottsville R.I.T. (Rapid Intervention Team).